Modern living places unprecedented demands on parents and children alike. Discover this unique opportunity to share experiences with your family as you bask in the natural surroundings of our stunning ancient woodland. Your family’s experience with Jack Raven Bushcraft will foster mutual respect, self learning, self confidence and strengthen bonds. You will leave us armed with new skills that we are positive you will want to pursue together. Be assured, your time with us will give you plenty of special moments that you will treasure forever. We’ve put this course together for families with children under 18; if your children are over 18 we suggest that our adult courses will be more suitable. Introduction to woodland wildlife, including some tracking games. The cost for this course is based on £125 per adult and £75 per child. The booking button below is configured for a family of 2 adults and 2 children (if your children are over 18 they need to pay the adult rate). If your family is different to this, get in touch and we can send a PayPal invoice or provide our bank details. You can view dates for all of our courses here. We will provide lunch on both days; you will need to provide your own evening meal and breakfast. We will ensure that tea, coffee, squash, biscuits etc. are available at our woodland camp. If you have specific dietary requirements, please get in touch with us at your earliest convenience so that we can make sure you are catered for. Our Family Bushcraft Weekend courses are based on a working farm campsite with full use of the showers and loos; the bushcraft activities are carried out in the adjacent woodland. There is a short walk from the meeting point on the campsite to our woodland camp. Campsite fees for Saturday night are included in your booking; if you want stay on the campsite for any additional nights, le us know and we’ll book you on. Great weekend on the Family 2 day course. The team were fab and we had a brilliant time. Will definitely be going back for more! At first I wasn't sure if this would be able to appeal for the whole family but Gary and his team really made us feel at home and we all learnt loads of handy new things , I loved it ! and would very much recommend then to any family outing. 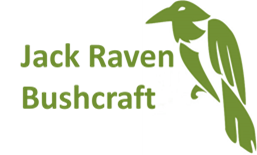 Thank you to everyone at Jack Raven Bushcraft ! Just did the Family Bushcraft Weekend with my two 10 year old boys. We really enjoyed the course. We all came away with new skills. And bags of confidence. Gary, Nicola and Willow (the Labrador) were great trainers. Food was very tasty and healthy - nettle soup was especially good! Sitting around the fire was fun too. The walk to and from the training site is lovely - I would suggest wellies or walking boots as our trainers were soaking and muddy. I will definitely recommend to friends. Had such an enjoyable 'Family Weekend'. Gary, Bob and Nicola are very welcoming... and patient!! Our girls had a blast, it was absolutely worth every penny to see them in the great outdoors learning some new tricks and getting back to basics. Will definitely be back... Thanks again!! Great Family time away from busy every day life. My Daughter thought it was great, skills for life!